It looks like the new Dooney & Bourke Limited Edition MagicBands that were recently announced now have a release date: July 23rd, 2016. According to the Disney Parks Blog, they will be put out for sale during a release party at Cherry Tree Lane inside the Marketplace Co-Op at Disney Springs. In addition to having the first opportunity to purchase the new MagicBands and the handbags, guests can meet Ian Ray, Creative Director for Dooney & Bourke. Ray will be at Cherry Tree Lane from 10:30 am to 12:30pm. It’s unknown if these MagicBands will make any special effects at touch points throughout Walt Disney World. Some of these come on a new exclusive white base band, come in a special gatefold box with exclusive MagicSliders, are limited to 1500 each, and have a very high price of $48 each. 13 Responses to "Dooney & Bourke MagicBands to go on sale July 23rd at Disney Springs release party"
Any news about them showing up in the Disney Parks App? I have not heard anything about when they may appear in the app. Hi do you know if you can purchase these online? Disney has said that these will be available for online purchase at some point if they don’t sell out at Walt Disney World. I called Disney asking about purchasing the new Dooney and Bourke magic band Saturday morning. Unfortunately, they will not be available for purchase over the phone. I was told the only way to purchase one is at Cherry Tree Lane in Disney Springs. Bummer!!! Have you heard anything different? Not sure, but I was there this morning and there was a huge line at 8am. Got out of the store around 10:30 and the line seemed longer. Lucky to say I got a full set but I think they may be sold out by noon. Seen some on ebay for $85. Really nice bands, art work covering the whole band. 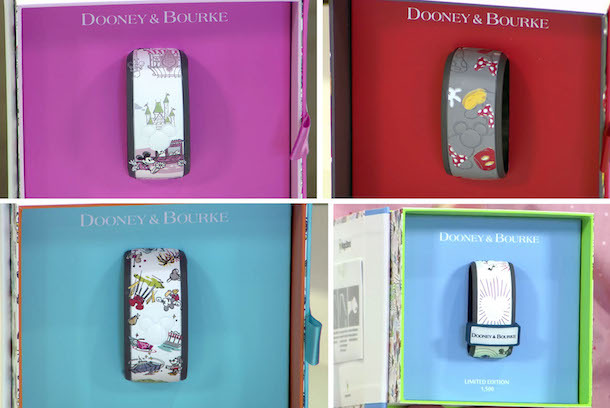 “@Nicole – The Dooney & Bourke MagicBands will be released via the Shop Disney Parks app. Look for them at a later date in July. special effect is just flashing white with no sound. It is a bit like a snowflake effect. They are not park specific so the effects only work at the entrance points.